With all the new types of carpet on the market when it comes to buying carpet tips it can be a bit of an overwhelming task. Be sure to check out the performance and the health benefits or Asthma Allergens characteristics. Definitely to make sure the type you are looking at will stand up to your expectations with Auckland Steam n Dry buying carpets tips. The wrong choice will not last. and you will be disappointed. Follow these 10 tips to buying carpet that works for you. Hardfloor is only beneficial to Asthmatics if it is mopped at least twice a week, failing that hard floor does not hold on to dust, mites, germs, pollen, and pollution. It simply sits onto on a hard floor, therefore, each time you step on the hard floor all those germs and asthma allergens re expelled into the air which the asthmatic has to breathe. This, therefore, is often not the best choice for asthmatics. Wool Carpet is often said to be asthma allergen free. It is hard to find unbiased information online. From my experience wool carpet is bad for my asthma. The reason being: * These natural fibers break down. Then small wool lint is expelled into the air, as a result, each time you walk on the carpets, bits of wool lint dust and asthma allergens are expelled into the air, therefore, the asthmatic has to breathe which causes inflammation and wheezing. There are 2 other factors in relation to the wool carpet for asthmatic: * Wool is porous which helps whole on to dirt, pollen, and pollution, which is good, providing regular weekly vacuum cleaning takes place. * Wool wholes onto moisture, therefore as a natural fiber it will be one of the first home items to start mold growth, this is not good for Asthmatics, as when stepped on is expelled into the air for the asthmatic to have to breathe. * Dust mites like wool carpet and breed unabated among the porous natural wool pile. (If you or someone in your family is an asthmatic or suffers from similar respiratory allergies then I recommend you don’t buy wool carpet. 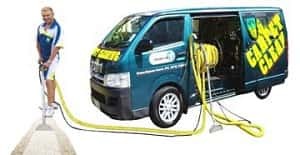 If you do be sure to vacuum weekly, also, truck mounts carpet cleaner with over 70 Celsius hot steam to help remove and kill dust mites and allergens every 3 months). therefore, each time you step on the nonporous polypropylene germs and asthma allergens re expelled into the air which the asthmatic has to breathe. This, therefore, is often not the best choice for asthmatics.it is okay for asthmatics provided its vacuumed regularly i.e. a least weekly, also, 6 monthly truck mount carpet cleaning with over 70-Celsius hot steam to help remove and kill dust mites and allergens. Solution Nylon carpets are similar to polypropylene carpets, however, softer and full bodied. This is a viable option for asthmatics, although, for the first month there can be a small which has been known to upset some Asthma sufferers. I didn’t notice any adverse allergies or asthma with my new Nylon carpet, and I’m usually very sensitive to any allergies. Again with regular vacuuming and truck mount hot steam carpet cleaning. Look at the twist in the individual yarn pieces. Several twists may give you good carpeting. The number of twists will affect the performance also the density of the pile. Do not confuse density with the height of the pile. Pile height has nothing to do with performance. Generally the more twists in the individual yarns, the more spring in the carpet. Remember that the more spring, the more footprints will be hidden. However, if you are looking for vibrant carpets you will have to trade off the spring because the more vibrant carpets do not have that crimped texture. You should look for stain protection, soil protection, and static guard. Most homeowners only clean their carpeting once a year so you will want a carpet to perform well over a three year period. Carpets should be cleaned at least twice a year; however, for heavy traffic areas, you may have to clean them as often as 3 or 4 times a year. The carpet industry has introduced some amazing buying carpets tips with stain protection, soil, and static protection, these new products are better than ever before. Always buy your carpeting from a reputable dealer. Look for a quality and customer service oriented dealer with a special carpet section. Make sure the dealer stands behind the products he sells. Look at all the different types of buying carpets tips that are available to you. Also, look at the various underlay pad available for the carpet. Don’t skimp on the underlay pad. Just because it’s not visible doesn’t mean it is not important. A cheap thin underlay will not do your new carpeting any good and will shorten the life of your carpet. An underpad that is too thin will not only fall apart under your carpets but will also damage the carpet over it. You should have your new carpet laying by a professional carpet laying. The dealer will either have their own installation crew or they will be able to direct you to someone they recommend. Vacuum or mop? Making decisions about the right flooring for your home can be hard if your family has asthma or allergies. Some used to say people with asthma and allergies should replace carpets with hard flooring. But this is no longer thought to necessarily the best option. Carpets can trap allergens in their pile, while hard floors allow the allergens to float around. Also, some modern buying carpets tips contain treatments to reduce mold and dust mites, which are common asthma and allergy triggers. Remember the floor where you place the carpet pad, should be properly prepared to protect the investment. The better grades of carpeting usually need a better grade of underlay or carpet pad. The color and texture will affect the look of the room, and, lighting conditions will affect the look of the carpet. If the carpeting is smooth or even surfaced, it will have a velvety look or plush look like you would want in a formal dining room. Use an oriental or a tapestry weave style to give a formal look to any room. To help a room look lighter or brighter, choose a more lustrous carpet fiber. Remember a smooth luxurious carpet will show footprints, also, vacuum marks. If you like this look then ask for a luster fiber; but if you do not like the look be sure to tell the sales rep that you do not want lustrous carpets pile. You can get the carpeting in an uneven surface where the looped pile is a bit uneven so it looks to be tailored. By combining different piles at different heights, you will have a sculptured look. This look can also be duplicated by the color or the carpet being varied colors. You will find that some carpets get this look by carving on the surface of the pile of the carpet. Remember that high pile carpet is not good for high traffic areas. 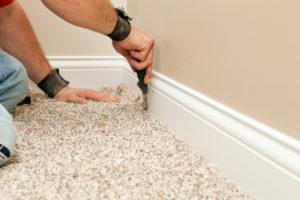 These fibers will be trampled and will be harder to clean, so use the best buying carpet tips. The basic pile or low loop is a good performer in a high traffic area. You will often see this type of carpeting in offices. It wears like iron and cleans up easier than a pile carpet. The chunky look of Berber will have a level loop, so, have a chunky look. The wear factor is good but not as good as level loop carpeting but it will hide the dirt better. Remember as like all things in life you will get what you pay for. A low-quality carpet is a low-quality carpet. Be aware, therefore, select the buying carpets tips you need and like. Just because it looks like a good deal at the time, you might not think that when you have to change the carpet in 3 years instead of 10 or 20 years. So shop carefully! Find out what the guarantee is on the carpet, furthermore, what the guarantee covers. Does it just replace the carpets or does it also cover the installation; what will void the warranty and what is also not covered? Know before you buy. These 10 buying carpet tips will have you choosing the right carpets for the room in no time. Your room will have a brand new facelift, and, look awesome! For the Auckland Steam n Dry buying carpet tips experts, call 0800 783-266, or email Auckland Steam n Dry.